Some people are very particular about using fruit in savory dishes. For example, my friend Sarah loves salads with strawberries. Me? I prefer my strawberries chocolate-dipped or in a smoothie, personally, but I totally get her. Spiralizing has really opened up my eyes to eating fruits with savory foods. I actually have a couple recipes in my cookbook (out March 2015!!!) that incorporate fruit noodles into main courses and salads. Cherries are in a league of their own – they’re the heartiest of the fruits, but so small. I find that every bite into a cherry is a satisfyingly tart forkful. 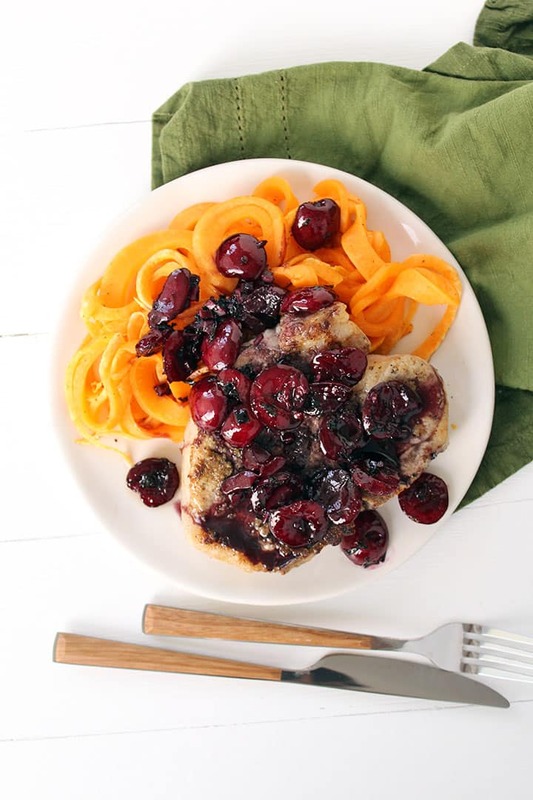 The tartness in the cherries make for a delicious sauce when reduced with wine and a little salty chicken broth. 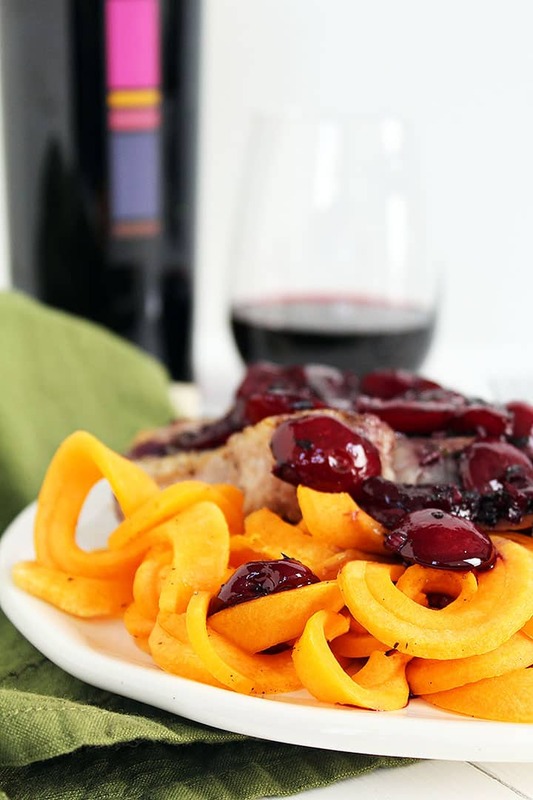 Then, spoon it over sweet butternut squash noodles and bone-in pork chops and you pretty much have an insanely impressive dish, that really doesn’t take much time to make. If you live in the NYC/NJ area, I really recommend FreshDirect‘s bone-in pork chops. While I love to go straight to the butcher for meats, I was pressed for time (it’s been so busy lately!) and did a clickity doo-da over at FreshDirect and then was so impressed at the beauty of their pork chops, as documented in this Instagram picture. Actually, I accidentally clicked 6-8am delivery time slot instead of 10am-12pm and I woke up in a panic when my phone started ringing and immediately thought the world was ending, because, you know, why would anyone call me at 6:30am unless it was my mom, calling to tell me something important/terrible? If you’re throwing an intimate holiday party or just making a holiday dinner for your boo/bae this would work famously. Also, happy first day of Hanukkah! I have a celebratory spiralized potato kugel coming your way this next week. 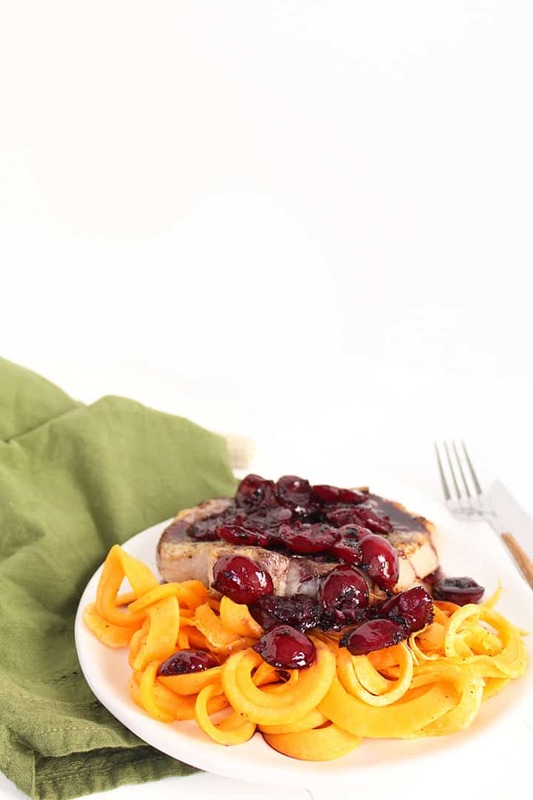 What are your favorite meals to make with cherries? Heat oven to 400 degrees. Line a baking sheet with parchment paper and lay out the butternut squash noodles. Spray the noodles with cooking spray and set aside. Rinse the pork chops and pat the dry with paper towels. Season generously with salt and pepper and then place the coriander and mustard in a bowl and mix until evenly combined. Rub the spice mixture all over the pork chops, on both sides. Set aside. Olace a medium skillet over medium heat and add in the olive oil. Once oil heats, add in the cherries, tarragon, and garlic. Cook, stirring frequently, for 1 minute and then stir in the wine and broth. Simmer, uncovered, for 10-15 minutes or until the sauce is reduced and thicker. Season to taste with salt and pepper. While sauce is cooking, place a large oven-safe skillet over medium-heat and add in the olive oil. Once oil heats, add in the pork chops and cook for about 4 minutes (about 2 minutes per side) or until bottoms are golden brown. Transfer the pan to the oven, along with the butternut squash noodles and bake until the chops are golden brown, about 7-10 minutes. If using a thermometer, temperature should register at 145 F in the thickest part of each chop. The butternut squash noodles should bake for 8-10 minutes. 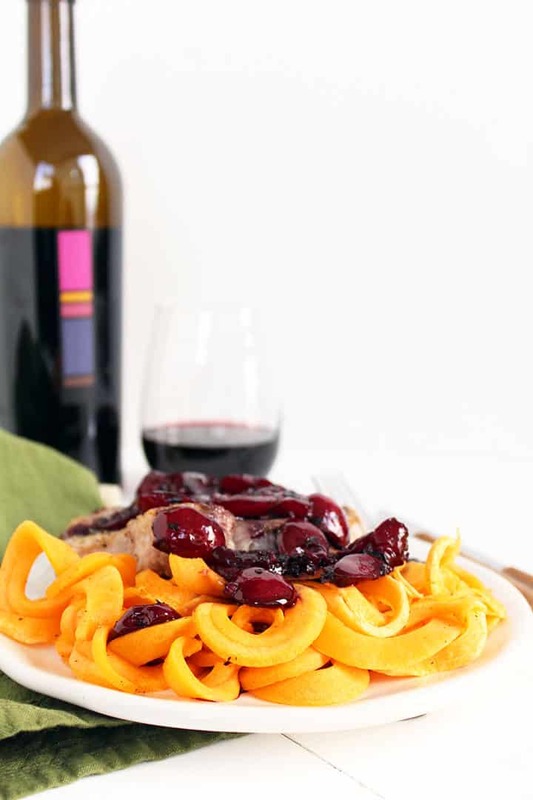 Divide the butternut squash noodles into plates, top with pork chop, and top with cherry-tarragon sauce. This sounds delicious and I will make it this week. I have one problem....I don't have luck spiralizing butternut squash. It was so hard to get it stay on the spiralizer...I even had my husband help...what a mess! Any suggestions? By the way, keep up the good work. I am a woman (Italian, I might add) in my late 60's and usually hate blogs, but yours is wonderful...your warm nature shows on your face and in your writings! My suggestions would be to make sure you cut the ends of evenly and flatly and if it's large (longer than 4"), then cut it in half for more leverage! Feel free to email me to continue the conversation! I had a lot of trouble spiralizing butternut squash too. Now, I put it in the oven whole while it's preheating (5-8 minutes, maybe? so it doesn't really start cooking, but it does soften up a bit). I've had really good luck using that method! This recipe looks amazing, I am going to try it out next week but using lamb chops. Just wondering what I can use instead of red wine - just add more stock? Thanks again for all of your recipes. Yes, you can use stock! This looks so delicious! I'm a big fan of cherries and pork together. Beautiful presentation! Made this last night with thin boneless pork chops. First time using butternut squash too. It was very good. 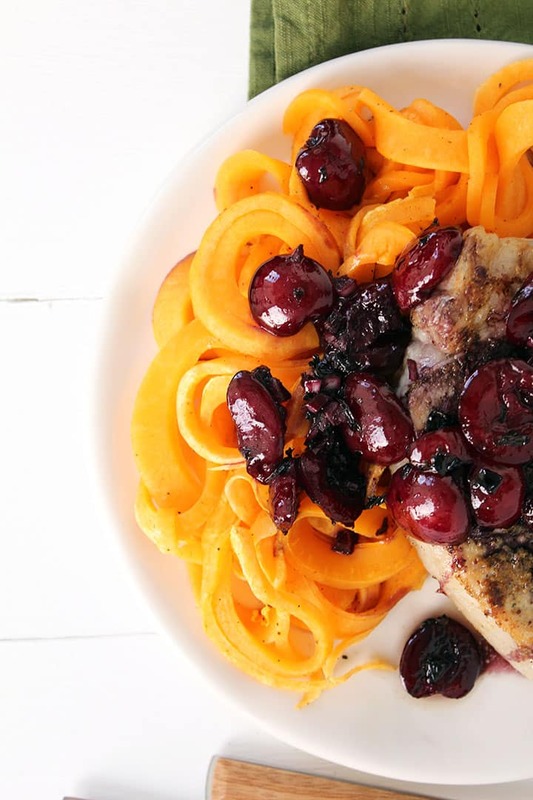 I think my squash needed a little more time in the oven, and my cherries were a little tart. Next time I might add a little honey to the sauce. But the flavor combo was great. Thanks for the recipe! This looks amazing! Do you think that if I made a bigger batch of the cherry sauce I could freeze it for future use? Do you think this would work with frozen cherries? If so, any tips to keep the consistency right? My husband and I made this for dinner last night and it was sooo good! My husband bought me a vegetable spiraler for my birthday (sadly, not an Inspiralizer) and I almost had him return it until I stumbled upon your recipes. Now, I'm a spiralizing fool! Thanks for the inspiration!! This is a great base, but I'd recommend some modifications to the sauce to make it more memorable. As it is written, the flavors in the cherry sauce are a bit muted. I stirred juice from 1/2 a lemon into the sauce when it was done reducing, and mounted it with half a teaspoon of butter to improve its mouthfeel. The acid in the lemon juice did a lot to make the cherry and tarragon flavors sing, and the tiny amount of butter gave it some body without adding a significant amount of calories. With these additions, this recipe is going into the regular rotation! Thanks!